A month after it was released on Nintendo Switch, Pokémon Quest has now made its way to mobile devices and you can download and play it now on both Android and iOS. The game is a free-to-play action title set in the world of Pokémon, but it's very different to the normal RPG Pokémon titles you may be used to playing. First off, Pokémon Quest has a very unique art style with blocky characters, and for the first time you'll have a Pokémon who can run around outside of their ball for most of the game. You'll be exploring around a new location called Tumblecube where you'll spend most of your time finding extra monsters and power-ups you can use when fighting. As it's a free-to-play title, you'll be able to spend your money in the game through microtransactions to get extra benefits. This is both very different to Pokémon Go and the normal titles you'll be used to playing in the franchise, but it has been an interesting idea on Switch so far and it's great to see another Pokemon game on mobile too. 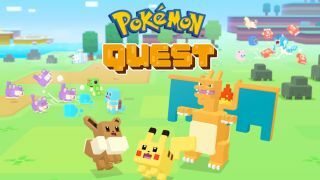 You can download Pokémon Quest on Android and iOS from their respective app stores right now, and you can watch the full trailer below to get a taste of what to expect.